I love my Sea Eagle! I never thought I could feel so comfortable in a kayak. I always was a bit nervous in my hard shell kayak, especially getting in and out. With the Sea Eagle, I don’t even think about it anymore, I can step right in without rocking the boat. If you want some fun don’t install the rudder! You can turn on a dime, I even went downriver backward for a spell. The one pain is waiting for it to dry completely before putting it back in the bag. It can take a while. I’d recommend this boat to anyone. I use my 300X for surfing in NE Florida. The boat surfs well and the many drain holes let the water out as fast as it comes in. The boat never bogs down with water. The skeg allows you to cut across the wave face, not just surf straight in. I pump the boat up to the maximum recommended pressures and there is very little flex on the waves. I have added a set of thigh straps to help lock me into the boat. I use a canoe cart to 'trailer' the boat the 3 blocks to the beach access, then carry it down to the water. I am 70, but I don't have any trouble carrying the boat. So far I have surfed beach break waist to head high waves. Surfing the 300X is a lot of fun and the boat is plenty rugged enough to get knocked around in the surf. If you surf anything larger than knee to waist high you probably are going to dump once or twice in a session, so be prepared. I wear a whitewater PFD and use a paddle board leash to keep me attached to the boat. 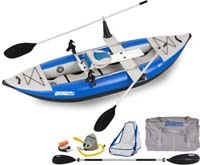 Solidly built, stable kayak, Nice size for 1 person. Our 300x kayaks are amazing! They fit our lifestyle perfectly. We travel in a small camper and have kayaked the Atlantic Ocean, Gulf of Mexico along the Florida panhandle and the Pacific Ocean. We have also paddled many lakes, streams & rivers from Nova Scotia to Glacier National Park. A highlight of our inland paddling was parts of the Colorado River. The most amazing paddling was off the Newfoundland coast where we paddled around an iceberg and thru an ice flow. An unbelievable opportunity! Easy to stow in our camper/car and hike down to the shore and inflate. Even carry them in our Mini Cooper convertible. Paddle great in the water and our dog Kirby loves to ride up front.